Update: Microsoft's search engine Bing has been restored in China after being inaccessible in the country for almost two days. According to sources familiar with the matter, Bing was blocked due to an accidental technical error and not due to an attempt at censorship. The news came as a surprise because Microsoft's search engine actually followed China's strict rules on censoring search results. After investigating reports from Chinese users, a Microsoft spokesperson has "confirmed that Bing is currently inaccessible in China" and that the company is "engaged to determine next steps." Microsoft's Bing becomes the second major search engine to ban from China, after Google search, which left the country, along with other Google websites in 2010, in order to avoid Chinese censorship. However, late last year it was revealed that Google had secretly been working on a censored version of its search engine to make a comeback in China, after an eight-year-long absence of the company from the country with the world's largest market of internet users. Although the apparent cause of the ban remains unknown, the ban comes a day after China's top search engine Baidu received complaints that it was promoting low-quality pieces from its news organization Baijiahao in its search engine, weighing down its shares. If users attempt to access Bing in China, the browser displays in a "connection error." 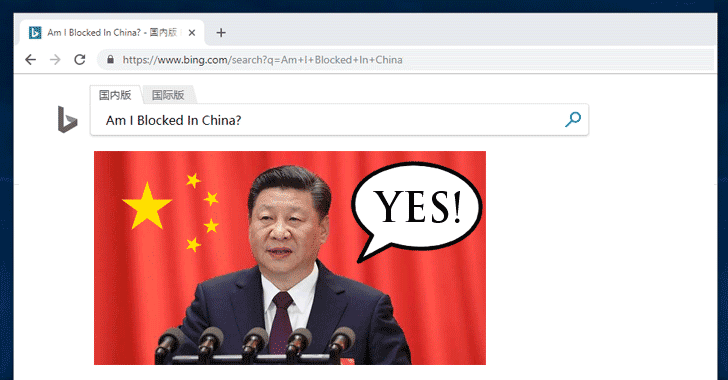 This is because the Chinese Great Firewall has now been configured to corrupt the connection and stop resolving the domain name associated with the banned IP address of Bing's China site. This is not the first time China has blocked a Microsoft service. In November 2017, the country pulled Microsoft's Skype Internet phone call and messaging service from Apple and Android app stores after the company refused to comply with their local laws.